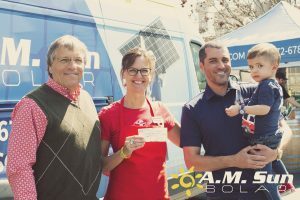 The Paso Robles Children’s Museum received a donation of over $12,000 from Paso Robles Solar installation company, A.M. Sun Solar. 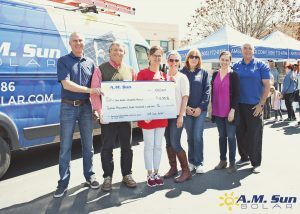 The donation was presented by A.M. Sun Solar to the Children’s Museum board of directors at the Free family play day held to celebrate the Museum’s newly installed 15.2 kW solar energy system consisting of 44 solar panels. Adam Scorby, the solar consultant for the project, also donated his commission of $2,000 back to the Children’s Museum. Over 1,000 children and families came out to the free play day at the Paso Robles Children’s Museum on Saturday, March 30. The museum co-hosted the event with Paso Robles solar installation company A.M. Sun Solar. Solar themed crafts and educational exhibits were on display as well as free gelato from Leo Leo Gelato in Paso Robles. The Paso Robles Fire Department made an appearance with a fire engine that the children could sit in and learn about fire safety. The newly installed solar energy system will offset 100 percent of the museum’s electricity usage and free up funds to install new educational exhibits. The equipment was provided at-cost and a portion of every solar energy system sold in March was set aside for the donation at the event.